Analog Design in Process Control is seen at the Sensor Signal Conditioning Stage. Controllers also use Opamps for Analog Computation Tasks. These are Real Time in the Truest Sense. A closed loop controller is the heart of an Industrial Automation System. Right from an On-Off Hysteresis Controller to a Auto Tune PID Controller, we find solutions of different complexities. Each solution might suit a particular system; depending on the requirements of Ease-of-use, Cost and Process Type. 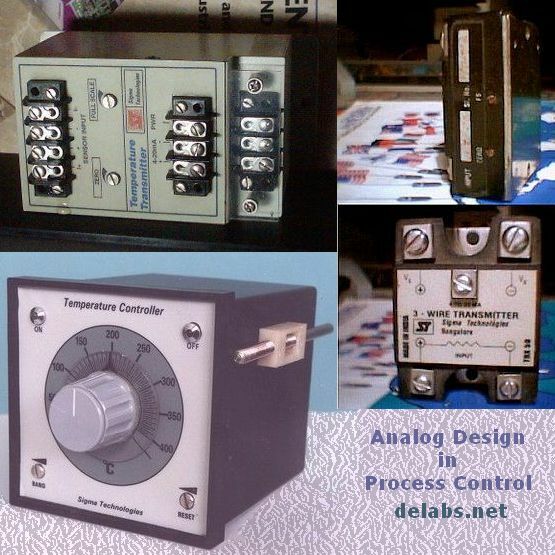 Even today, the controllers at every stage of evolution, from the thermostat to Auto-Tune, are used in many countries, for many different industrial applications. No solution above is obsolete! The developing Countries still use electro-mechanical or semi-automatic means for control in some areas. Digital Display - Analog Controller - On-Off. Digital Display - Analog Controller - Proportional. Digital Display - Analog Controller - PID. Process Profile Controller (Microcontroller Based). Microcontroller Based Fuzzy or Auto-Tune PID Controller. Data Logger, Computer, PLC or SCADA based Solutions. A PC based multiplexed scanner controller with data-acquisition cards and I/O Cards can be solution for Laboratory or Research. This is used when real time control is not required or where the control failure will not lead to damage or loss. A PLC or Microcontroller based controller should be used with a Analog Controller Protection or Over temperature Trip-Alarm. Outputs could be Relay or SSR, Voltage and Current outputs like 0-10V and 4-20mA are needed sometimes to drive DC/AC Drives or to control Motorized Valves. Relays and SSR can be On-Off or Time proportional (PWM). The Cycle times can be 10-20 Secs for Electromagnetic Relay and around 1 Sec for SSR. This is because Mechanical Relays and contacters have limited number of operations. The zero crossing SSR has to be cycled slower than mains frequency. In Curing rubber, which is one of the more complicated process, we need a profile based controller, which also triggers other timers or counters which need to be activated at different segments. When a very big area is controlled, with materials or load placed un-symmetrically, Every corner or section has to have separate sensor and controller. These are then governed by a SCADA, Supervisory PLC or Master Controller. Even a Big Die for Plastic Moulding with an Unsymmetrical Object or long object to be moulded; needs compensation for sides which will absorb more heat.